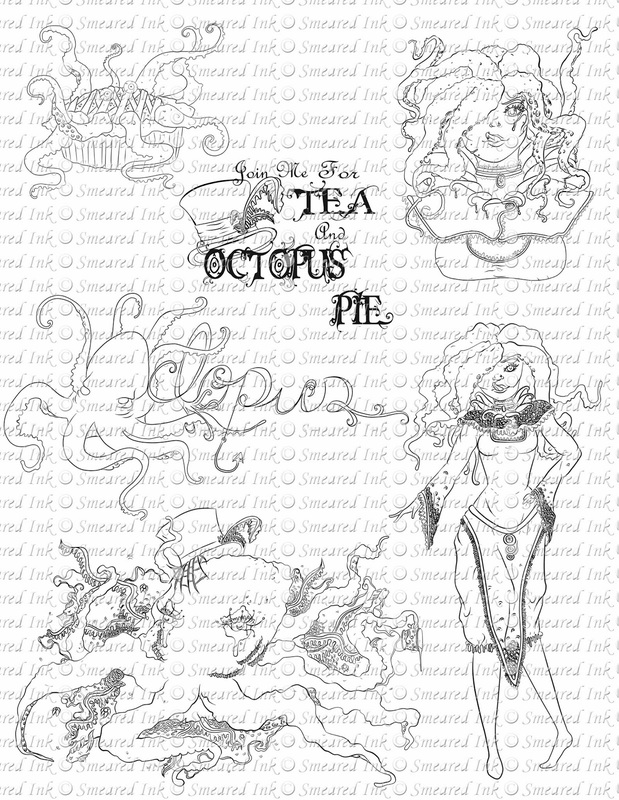 "Join Me for Tea and Octopus Pie"
Left: "The First Keeper" and "Join me for Tea and Octopus Pie", Right: "Octopus Girl Closeup"
We all had the pleasure of creating with Smeared Ink's two new digi sets, The Keepers and Octopus Pie which are now available in the Smeared Ink store! My mission this year is to finally use a bunch of junk goodies I've been hoarding and cluttering up my art studio for ages and in the process "tidy" my studio at the same time ;0) So for this hop I upcycled one of two cardboard glove inserts and made this fun, very unique, rather quirky but still oh so pretty "glove dinner invitation"! I also used some pink tulle and lace from my stash too! 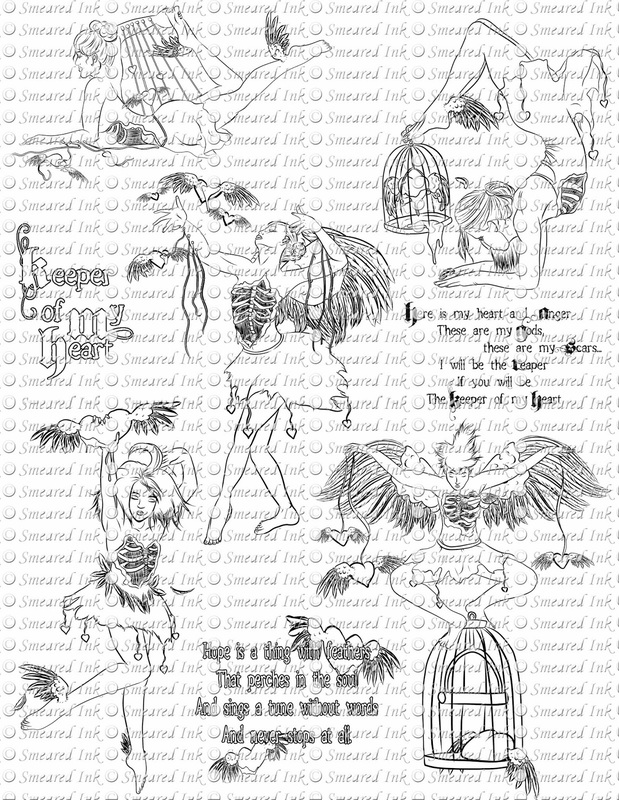 I featured images from both of the new releases and also used winged heart rubber stamps from Smeared Ink's Rubber Club exclusive Heart Wings set which can be ordered from the Past Offerings section. Upcycled glove insert stained with Aged Mahogany Distress Stain. Winged hearts stamped with Black Soot Distress Ink. Images printed and coloured with Spectrum Noir markers. Spun Sugar Distress Ink applied to the images and distressed edges. White gel pen used for all the detailing. Thanks for hopping with us today, your next stop is my teamie, Kapree! So creative and love this use of the glove insert to show off the new images. Amazing color and am in love w/ your handwriting...soo pretty. GORGEOUS Leigh! Oh my gosh, this is such an original idea! Never thought to use those glove inserts for anything, although now I can only say "duh". You combined the sets perfectly, awesome showcase of our stamps! WOW! Leigh you gloves are beautiful and what a clever idea.....FAB! These gloves are really beautiful !! !